The deputy governor of Afghanistan's Kandahar province was killed in a suicide attack Saturday, a government official said. CNN's Arwa Damon reports on kidnappings and attacks in what was a "safe" Afghanistan province. 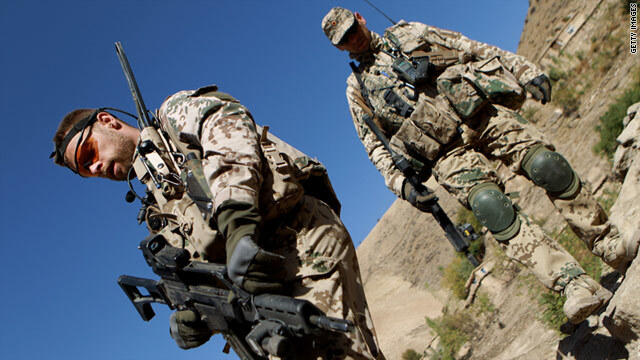 German Bundeswehr soldiers patrol high ground during a regular patrol on October 11, 2010 in Narwan, Afghanistan. The German parliament voted Friday to end Germany's combat mission in Afghanistan by 2014. For the first time, the mandate authorizing the use of German troops in Afghanistan contains a time frame for the nation's troops to withdraw, said Guido Westerwelle, the foreign minister. The mandate includes a 12-month extension of the current military mission in Afghanistan, the German Bundestag or parliamentary news office said. "It is confirmation of the work of the government that we're not just lengthening the mandate, but that we're saying that it shouldn't be endless," Westerwelle said. Germany has 4,590 troops serving with NATO's International Security Assistance Force. he Taliban claimed responsibility Friday for a blast that killed eight people at a market in the Afghan capital that is popular with international residents. At least six others were wounded, authorities said. CNN's Arwa Damon reports that overcrowding in Afghanistan prisons is creating an ideal breeding ground for the Taliban. Afghanistan's new parliament was inaugurated in Kabul on Wednesday, four months after a nationwide election that critics said was marked by extensive fraud. Relatives of a 21-year-old Pakistani woman are under arrest for allegedly electrocuting her because she secretly married a man they didn't approve of, police told CNN. tipped off by an anonymous caller, said police official Muhammad Ismail. 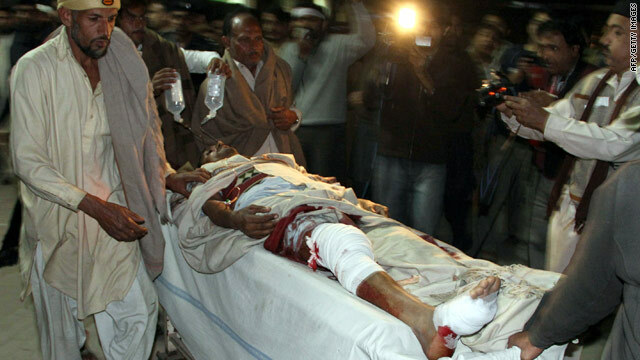 Pakistani men shift an injured blast victim to a hospital following a suicide bomb blast in Lahore, Pakistan. Suicide bombings targeting Shiite Muslims on Tuesday killed 16 people in Pakistan, 13 in Lahore and three in Karachi. of the Prophet Mohammed's grandson. reporters that dead bodies, including one woman, were brought to the hospital. were also brought to the hospital, and 15 of them were in critical condition. targeted the Lahore procession and labeled the Shiites enemies of Islam. The group is an offshoot of the Pakistani Taliban and Laskhar-e Jangvi. Both Sunni militant groups are notorious for targeting Pakistan's Shiites. One of the senior leaders of Fedayeen-e Islam is Qari Hussein - widely believed to be the trainer of child suicide bombers for the Pakistani Taliban. Nayab Haider, Lahore police spokesman, told CNN the suicide bomber was between 13 to 15 years old and that the boy tried to enter the procession carrying a bag. Moments after police stopped him, the attacker blew himself up, Haider said. Local TV reports showed footage of debris and rescue crews whisking away injured people.